Floy Marie Bryant was born on February 16, 1928 to Aurthur and Emily Perkins in Searight, Alabama. She was the 5th child of nine other siblings. Marie knew the Lord from a very young age, and she starting singing in the church choir when she was five years old. Her Sunday school teacher, who would later become her mother-in-law would stand her up on a table to sing in front of the church. Her melodic Soprano voice would be her signature as she matured in her faith. When she was 9 years old, she lost her mother, and it had such a profound impact on her life. Mother Marie always said that since she lost her mother at such a young age, she would always make every effort to be a loving mother to not only her own children, but every child she encountered. Marie married the love of her life Deacon James T. Bryant on October 25, 1947. They were close friends and their families knew each other quite well. They relocated to Middletown, Ohio after James gained employment at Armco Steel in the Masonry Department. As They began to build a life together, they soon joined Peoples Friendship Baptist church which would later become Tried Stone Baptist Church under the leadership of Rev Herbert Hart. 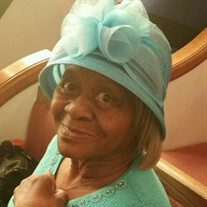 Marie was the last living chartered member of the 12 original members of Tried Stone Baptist Church and was instrumental in the building of the foundation of the church. She was a member of the choir for over 50 years, a Deaconness, Kitchen Committee and served in many other capacities for Tried Stone. She was known for playing the "tambourine" and "making it sing"! After retiring from the choir stand, she faithfully sat on the right side of the church in the third row, and loved to sing along with the praise team every service. She will always be fondly remembered as the "official mascot" of the Anointed Voices Praise Team. Marie and James had 9 children, 6 of whom they raised. Three of the them were lost as young children, as well their eldest son James (Jerry) O Bryant who went to be with the Lord in 2008. The Bryant family is known for their singing, and it was a legacy that was passed on to each child and many grandchildren from Mother Marie. She was an avid reader and always valued education. She was able to send all of her children to college. She was a loving and kind mother, with a feisty spirit, and always made sure her children were well fed as well as the many other children of the neighborhood. She never wanted a child to go hungry, and children were her life and passion. Marie became fondly known as "Granny" after her first grandchild, which depicted Granny from the Beverly Hillbillies TV Show. She was the rock and refuge for all of her 23 grandchildren and 23 great grandchildren. Granny raised and loved all of her grandchildren unconditionally, and it was a rite of passage for the grandkids to stay at her home every weekend. She was always in the kitchen cooking, and no one ever went hungry in Granny's house. She rocked every grandchild to sleep singing her favorite hymn, "Nothing but the Blood of Jesus", and every grandchild knew the hymn from a young age. It was a legacy she passed on to all the generations. To all she encountered, Mother Granny Marie was kindhearted, welcoming, giving, and most of all loving. She loved with all her heart, and that was her true calling in life. She cherished her family and close friends, and served as an inspiration and beacon of light to all. She will forever be in our hearts, and her life as a mother, grandmother, sister, aunt, and friend will be the guiding force of a legacy of memories that will forever be valued in our lives. Her love represented the fabric and tapestry of all who experienced the gift from God her presence represented. Make room Angels, for another voice worthy to join you in singing! Holy, Holy, Holy to the Lord God who was, is, and evermore shall be! Mother Marie Bryant leaves to cherish her memory, 5 children: Donald (Malissa) R. Bryant, Linda J. Bryant, Brenda C. James, Magellan L Bryant, and Michael J. Bryant. Her beloved grandchildren: Cyndi Thomas, Roxanne (Lavonn) Berry, Melissa Major, Magellan (Julie) Leroy Hooks, Michelle (Meelis) Juhanson, Amanda James, JC Bryant, Ashlei (Jon) McGuire, Jonathan (Sandra) Bryant, Jonathan (Lorin) James, Adam (Breon) Bryant, David Preston, Gabrielle Bryant, Evan Thomas, Megan Thomas, Michaela Bryant, Jordan Thomas, Tyler Bryant, Linden Bryant, Alissa Bryant, Tayler Bryant, and 23 Great-grandchildren all of whom she loved unconditionally.